You are here: Home » The End of the Movement? The End of the Movement? The modern missionary movement didn’t start with a bang. The great missionary to India William Carey may be dubbed its father, but he was himself a child, a product, of missionaries of the previous century, men like David Brainerd and John Eliot. But the moniker fits, because Carey did leave a massive legacy. In the ensuing decades, thousands of Protestant missionaries were sent to field around the world. Similarly, if the modern missionary movement is going to die, it is unlikely to do so by gunshot. No one will lay an axe to the root of the tree. Instead, we will one day discover the leaves have browned and the branches are brittle from drought. I think there is good evidence that the modern missionary movement is in fact coming to a close, and I’ll try to show you some dry leaves. What would it even look like if the modern missionary movement ended? Well, think back to the time before it began. The majority of Protestant churches showed no concern over the fact that the majority of the world’s people did not have access to the gospel. They did not believe that it was their responsibility to make it available. Therefore, they did not send missionaries, they did not give money to missions, nor did they pray intentionally for the world’s masses. Carey’s time saw an exponential increase of these activities. When I say that the modern missionary movement is in decline, I mean that those activities are waning. Fewer missionaries are being sent, less money is being given, and Christians are less concerned to pray. In short, we are returning to pre-Carey levels of Great Commission activity. But that is demonstrably untrue, isn’t it? The church still sends, it still gives, and Christians still feel strongly about the need of the world. We don’t resemble the pre-Carey church at all, do we? Certainly, the modern evangelical church seems to be in little danger of denying the world’s need of the gospel or the church’s responsibility to bring it. No one is talking of retreating back the way we came. However, there is more than one way off the mountaintop of modern missions: we need not fall down the same way we climbed up! Modern evangelicalism looks drastically different on many fronts than pre-Cary Protestantism, but the meters of Great Commission activity seem to be dipping down toward the levels of those times. How could this be? This, of course, is not to deny that the ‘biographied’ missionaries of the modern era were involved in what we would today think of as humanitarian efforts. Carey certainly achieved some monumental things in this regard. But these works that characterized their ministries were, I think, manifestly different from the ones that characterize 21st century missions. There would be a few evidences of this, I think, but let me give the one that has stuck out the most to me lately: the old missionaries by and large did not think their social action was an end in itself. Their real goal was to proclaim the gospel to the heathen. Take, for example, the writings of Carey himself. His little book ‘An Enquiry into the Obligations of Christians to Use Means for the Conversion of the Heathen’ (if the title didn’t say it clearly enough) is clearly concerned with a single fact about the heathen: that they are heathen! Not that they are poor, hungry, illiterate, victimized, disenfranchised, diseased, or underprivileged – but that they are unconverted! When Carey does mention social evils such as cannibalism, it is primarily with respect to how they pose a threat to the advancing missionary force! He says, for example, ’As to their uncivilized, and barbarous way of living, this can be no objection to any, except those whose love of ease renders them unwilling to expose themselves to inconveniences for the good of others.’ Yes, their barbarous lifestyles are awful, he says, but that should not stop a missionary from going. I understand if you have some doubts that this is really happening, that there is really that big of a gap between the missiology of, say, 1814 and 2014. So let me give you a couple notes for you to consider, and then I’ll wrap it up. Doubtless, there are many, many faithful missionary proclaimers of the gospel scattered throughout the world. Truly, I thank God for every one of them. Many millions of dollars are spent on gospel furtherance every year. I recognize that, and rejoice in it. The point of this post, however, is to highlight a trajectory of decreasing Great Commission activity. Less and less of our exported manpower is the gospel-preaching, church-planting sort of missionary. Less and less of our missions budgets are designated for strictly gospel ministry. And this trend is not restricted to theologically liberal groups. Go research the amount of manpower and money that ends up overseas from even the most conservative of missions organizations and see for yourself what percentage of it is earmarked for the preaching of the word and the establishment of churches. I have been repeatedly astonished – both by statistics and personal encounters – at the low percentage of both ‘missionaries’ and ‘missions dollars’ that ends up being used to give the gospel to those without it. Recently, I stumbled across a series of lectures on church history by Dr. John Gerstner (from the late 80’s, I believe). I watched a couple of the talks he did covering the time from Carey up through the 20th century. Couldn’t look away. All I could think was, ‘This guy is a fossil!’ In no more than the space of half an hour, I heard him: decry an early form of the insider movement, assert that the vast majority of people in christianized contexts are not truly converted, deny the legitimacy of mass conversions, debunk the idea that the gospel must penetrate every area of the world before Christ’s return, and affirm that the mission directs us to give the gospel to as many individuals as possible! Listen to his talk, then read half a dozen missions blogs and see if you can’t feel the distance that has been traveled between his day and our own. I think Gerstner would be amazed at the status quo of missions 25 years later. This is an experiment that could be repeated countless times with the church’s teachers from the past. They simply held to a definition of the church’s mission which we now find narrow, unbalanced, and even hypocritical. In closing, I believe that this expansion of the Great Commission to include humanitarian-type efforts is a largely unexamined trend. I hope even those of you who strongly disagree with my post would agree that what’s needed now in missiology is a more rigorous examination of Scripture to determine the limits of what should be included in the church’s mission. On the one hand, the ‘expansionists’ need to move beyond statements like, ‘Well, Jesus healed people before he preached his message to them.’ And on the other, ‘traditionalists’ like myself need to move beyond statements like, ‘What good is clean water going to do the heathen when they end up in hellfire?’ Either one of these statements may stand behind the truth. But the mandate of Scripture itself is going to have to decide the issue. God speaking through Scripture is what awakened Carey and his movement; it alone must guide us in our modern modern missionary movement. With all necessary qualifications being assumed, I agree with this post. Excellent! Your posts are always very provoking, in thought and in action. God bless! Amen! Missions today have gone far to the left from the missions of yesterday. In many cases the devil is stealing away what should first be used for the preaching of the Gospel. A dear sister who is now in heaven said when our church was in Mexico and saw the children in the streets begging. She said, i know your heart breaks for them but keep in mind they need the Word of God first and foremost in their lives. Very thought provoking. And I would have to agree. 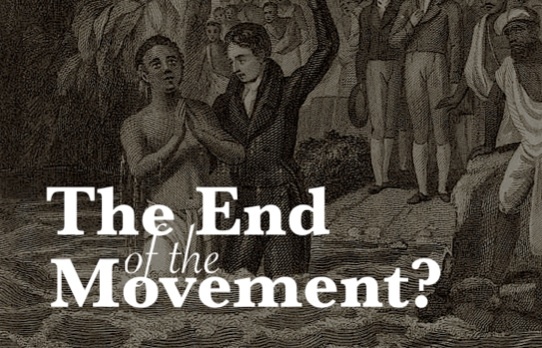 Is the modern missionary movement as we know it about to end? If so, what can we do, and what needs to be done? Here are some provoking thoughts and concerns on the matter. A very good article filled with truth! Having served on the mission field, I count myself a traditionalist when it comes to missions. Alas, while it is important that people be clothed, fed, schooled, etc., it saddens me to see that (in many cases) what is being given less importance is their ultimate meeting with God before His throne. How can we become rich like you in America? As an ex-missionary to the same country where you are, I mostly agree with what you’re saying. Modern-day missions – especially the short-term missions – are often looked at as “working vacations” for mostly young people who haven’t had a lot of training or concentrated preparation for going or visiting abroad. I fully believe in short-term missions – make no mistake – but I think for longer missions lasting at least a school-year, there’s not nearly enough preparation being given. I myself felt massively underprepared for the task I undertook! Granted, it was partially my own fault – but I think if I’d had an older, wiser, more experienced person teaching and preparing me for what lay ahead, the whole experience I had would have been much less of a shock. As a result of underprepared “teachers”, the Family overseas becomes disillusioned, confused, and vastly underprepared themselves. As for the PRC itself, I like to think that part of the reason for less foreign missionaries is the existence of more genuine locals who have accepted the Gospel. I know this may be hoping against hope, but I would like it to be true. Interesting read. I think that it is time for the new missionaries to arise and start a fire that will blaze a trail to ends of the earth.